alaTest has collected and analyzed 281 reviews of Toshiba Camileo S30. The average rating for this product is 3.6/5, compared to an average rating of 4.1/5 for other Camcorders for all reviews. Opinions about the size and image quality are on the whole positive. The price and portability are also appreciated. There are some less positive views about the zoom, and there are mixed comments on the viewfinder and memory. We analyzed user and expert ratings, product age and more factors. Compared to other Camcorders the Toshiba Camileo S30 is awarded an overall alaScore™ of 84/100 = Very good quality. The Toshiba Camileo S30 pocket camcorder looks and feels like a real video camera, with a big screen and plenty of features, but its performance is only average. Shoots 8-megapixel still images. Build-in flash. Large, articulating LCD. Storage is expandable. Video quality not up to par with competitors. Not left-hand friendly. Interface is difficult to use. The Camileo S30 will fit the pockets of many videographers looking for a portable option. 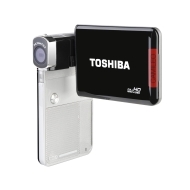 Can Toshiba give pocket Internet camcorders something to think about? After 3 months using the camera, it doesn't turn on anymore. Seem to be the same problem as other reviews.